Battery storage has emerged as a hot topic in the renewables space partly because battery costs—notably for lithium-ion batteries—have fallen by 60% over the past five years. Stationary battery storage system costs are expected to continue dropping with advances in power conversion equipment, more integrated product design and reduced regulatory barriers. Despite these cost declines, viable commercial applications for batteries are still largely confined to small frequency regulation markets and peak demand reduction in optimal locations. The future is bright however, as costs declines will open up new market opportunities in utility-scale peaking capacity, distribution network deferral, and behind-the-meter bill management. IHS Markit expects battery storage will grow from 1 GW currently deployed each in the United States and in Europe to 3 GW by 2020, with California, Germany, Italy and the United Kingdom leading the way. 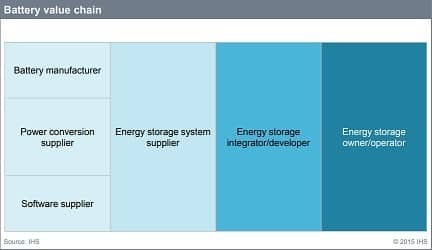 While batteries can provide value in many areas of the power system, they exhibit particular synergies with intermittent renewable resources, a fact that is evident in the growing trend of hybrid solar-plus-storage and wind-plus-storage projects. Batteries co-located with wind or solar can be used to avoid curtailments, smooth out production ramps, and shift energy to more valuable times of the day, while also saving on installation and infrastructure costs. Co-location is not strictly necessary however, as batteries can also support the value of renewables via a long-distance relationship over a transmission line. By charging during peak generation hours (e.g., mid-day for solar) batteries act like load, increasing prices and hence the value of renewables. There are, however, diminishing returns to the value of battery storage to renewables. At high solar penetrations, for example, curtailment may be used to keep the system in balance. Initially that may occur over only a small number of hours, but if solar penetrations increase further the number of consecutive hours of curtailment will also increase. Thus the amount of battery storage needed to avoid those curtailments increases in both MW and MWh, which becomes increasingly expensive. Renewables, conversely, help improve the value of battery storage in multiple ways. First, high solar penetrations increase energy arbitrage margins by depressing midday prices. Second, because renewables-generated energy can be inconsistent, energy systems need more resources for balancing and regulating frequency, a function at which batteries excel. Third, increasing solar penetration could reduce peak period duration, which is significant because, over the long run, as battery costs fall, they could become viable competitors for providing capacity in a growing market. In short, renewable energy creates a market pull for battery storage and increases its value. Co-located wind-energy storage and solar-energy storage projects represent a small but growing market in the United States. In the United States, near-term battery storage growth will focus on California, Hawaii, the Northeast, and the Southwest. In the longer term, the market will be national. The wide scope of technologies involved in battery energy storage systems creates market opportunities for companies across the battery value chain.